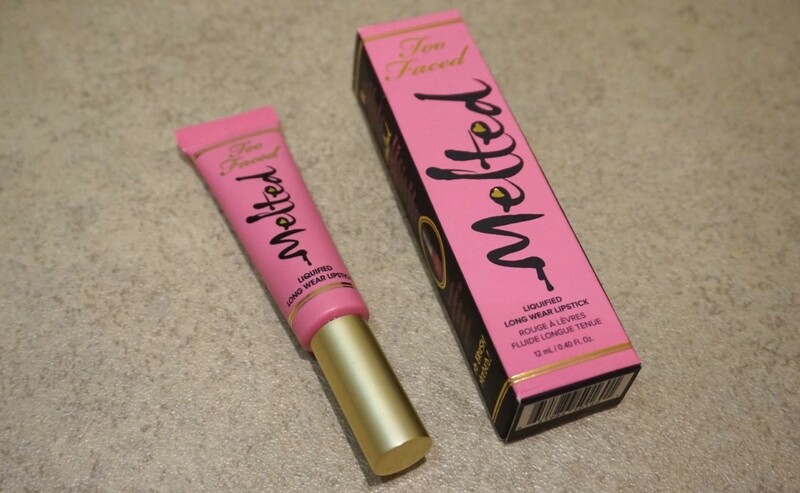 I actually meant to purchase a Too Faced Melted Matte Lipstick when I got this a few months ago and ordered this product by mistake. I was pleasantly surprised by the outcome, but I’m 100% planning to purchase a few of the matte colours soon to see what all the hype is about… I’ll let you know how I get on (the tubes look so pretty!). The Too Faced Melted Lipstick in Marshmallow cost me roughly £19 when I bought it, but if you guys head to their website right now, they have a discount running on the Melted range which has dropped the price to £9. Who could dispute that for a middle range product! The Marshmallow shade is rather pink and I have to admit, looked a little less ‘baby pink’ online. I know, I know – what else should I have expected from a product called ‘marshmallow’?! Regardless, I was still happy with the warm colouring and easy application tube. The ‘paint’ formulation is thick, nourishing and slightly glossy, although please be warned, as with other lip paints, the natural lip will be revealed in the centre of the mouth after a few drinks, due to the consistency of this product. Granted, I must give this specific lip paint credit above others, as it stood the test of time better than a number of alternatives I have tried – at both a high-street and high-end level! If you’re looking for a drugstore dupe, I would 100% recommend the Maybelline Color Jolt Lip Paint in ‘Never Bare’. Although slightly pinker (think Barbie pink) than the Too Faced Melted Lipstick, the two are very similar. As you know, I’m a member of the Maybelline Squad, which means that the lovely team send me goodies to try throughout the year. I’m not obliged to say I love things but I can honestly say that their lip paint has definitely stolen a place in my heart where high-street products are concerned. Even the red shade, which I was quite hesitant to try (as only matte red lipsticks reside in my makeup bag) impressed me! Best of all? It’s only £4.99 – a fraction of the RRP of the Too Faced equivalent! Let me know if you’re going to splash the cash and purchase the Too Faced Lipstick or choose the dupe and go for the Maybelline Lip Paint!